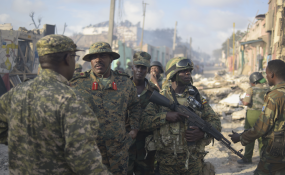 African Union troops in Somalia. At least 10 people were killed on Tuesday morning when Al-Shabaab and government clashed in the Gedo region town of Bardheere, Radio Dalsan reports. Two government soldiers and eight militants were killed in the fighting according to an official of Gedo region. Al-Shabaab had attempted to overrun the Bardheere Military camp but failed to succeed in executing the attack. The Al-qaeda linked group has intensified its activities since last Friday when they attacked the Hiraan region's Moqokori town where it claimed tens of SNA soldiers were killed. The group displayed bodies purported to be government soldiers. The town was recaptured on Saturday. On the same day in Puntland's Balikhadar area the militants attacked a military camp killing 5 soldiers. Local authority said at least 40 militants were killed later including 27 in a US airstrike.